Since 2011, I have made occasional forays into gender auditing as a way of paying attention to my position in the remarkably unequal field of contemporary music composition. My attempts were occasional — a couple of analyses of my immediate environments in recognition of International Women’s Day, some (perhaps brash) comments upon finding myself programmed on all-male concerts — and their irregularity was problematic. The data on this page includes events since 2007, running up until the time of posting. I don’t currently have the data to analyse how a composer’s age factors into this, but I’m working on it. It is often stated that there is a gradual filtering out of women at every stage of career progression: from school-age music studies, throughout academic pathways, and later in professional contexts. My data is limited, but I can compare the 4 years I was an undergraduate and masters student at the University of Manchester — when the vast majority of my performances were in student contexts and 24.7% of works performed were by female composers — with the period since then, for which that figure is just 14.6%. That amounts to a drop in representation of 40.8% in the 5 years since my Masters graduation. Just 2 concerts (of 54) have featured a programme where half or more of the works are by female composers. On average just 17.7% of works played are by female composers. Tomorrow I will build a house… where? There are fascinating differences to be discovered in the way each duo handles the piece, so suffice it to say it’s a pretty exciting month for me. Berlin-based quartet DieOrdnungDerDinge are going to give the first performance of rumour — distant land at tonight’s opening event of this year’s Bludenzer Tage zeitgemäßer Musik. We’ve been hard at work since late on Tuesday and the whole evening should be memorable. (It will also feature vocal performances from the spectacular Ute Wassermann.) Thanks go to everyone who has made this happen! 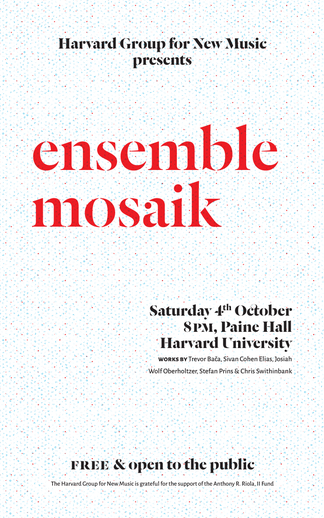 On Saturday, 4 October, Berlin-based ensemble mosaik are performing at Harvard University. The culmination of a weeklong residency, they are presenting new pieces by Trevor Bača and Josiah Wolf Oberholtzer as well as performances of some of Sivan Cohen-Elias and Stefan Prins’s most recent music. My latest piece, Tomorrow I will build a house here, if I can hold still, a duo for flute and cello, is also on the programme. 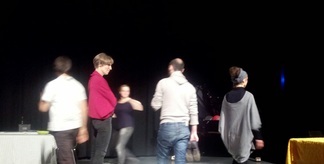 In my case, I can’t thank Bettina Junge and Mathis Mayr enough for their hard work and thoughtful rehearsal. It has been a real pleasure.